Stems: Ascending to erect, usually branched, hollow, glabrous, usually glaucous, nodes often swollen. Leaves: Cauline, alternate, simple, glabrous, sometimes glaucous; petiole .4 to 3 inches; blade ovate to elliptic, 1 to 5 inches long, .8 to 2.5 inch wide, base acute to rounded, margins crenate to dentate, tip obtuse or acute. Inflorescences: Axillary, flowers solitary or in clusters of 2-6; peduncles .4 to 1.6 inch. Flowers: Usually pale yellow, rarely white, usually unspotted, rarely with red spots, .8 to 1.4 inch, spur .16 to .25 inch, bent at right angle to sepal, never coiled; sepals 3, lower 1 petal-like, prolonged into tubular spur; petals 5, upper 1 distinct, lateral 4 connate in 2 pairs; stamens 5. Fruits: Capsules .6 to 1.1 inch, clavate, fleshy, dehiscing elastically into 5 spirally coiled valves, dehiscence explosively loculicidal; seeds dark brown, oblong to ovate, about .2 inch, slightly flattened, tip with short, blunt beak, surfaces covered with sharp wrinkles or net-like ridges. Habitat: Moist woods and thickets, stream banks, and wetlands. Forage Value: The seeds are eaten by the white-footed mouse, ruffed grouse, ring-necked pheasant, greater prairie chicken, and bobwhite quail. Comments: Impatiens - not patient, alluding to the ripe capsules that snap open elastically when touched and pallida - pale, alluding to the flowers. 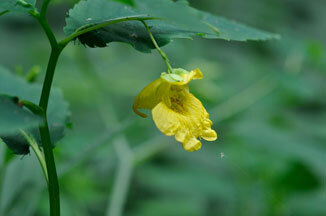 The common name jewel weed refers to water droplets that sometimes form on the leaves, causing them to glisten.